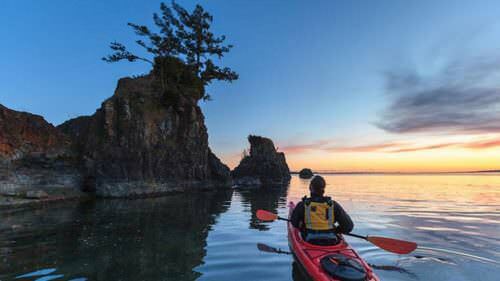 Lincoln City has over 7 miles of shore to explore — more than any other Oregon coastal town. That’s why you’ll often see visitors in the sand with tools, digging up purple varnish clams, on the shore catching Dungeness crab, combing the beach for agates and handblown floats, and tip-toeing around tide pools teeming with spongy sea anemones, colorful sea stars and elusive hermit crabs. “The tide pools I take my groups to in Lincoln City are a goldmine,” says Fawn Custer, Lincoln City’s tide pool clinic marine expert. “You can see up to 100 different species living under the mussel clumps; urchins, sea cucumbers and tons of fish.” Custer says her grandson even once found a seven-inch-long cabezon fish in a tide pool. 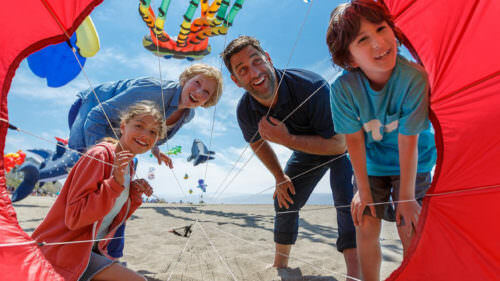 Here are four ways you can experience Lincoln City’s shores throughout the year. 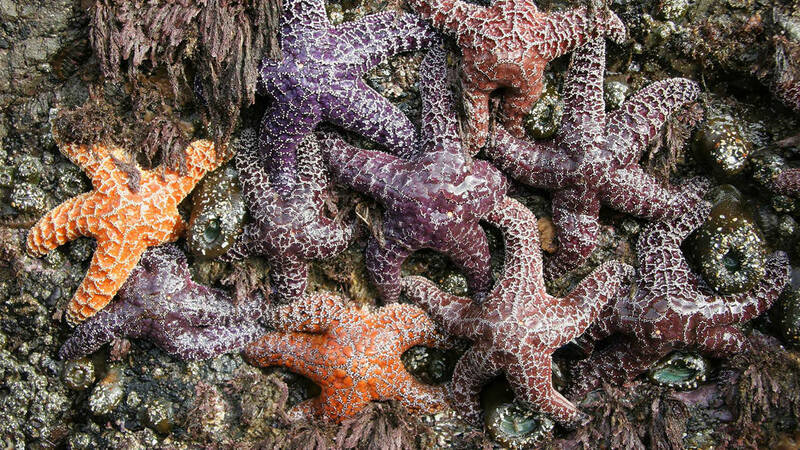 Find a rainbow of starfish and other creatures at a tidepooling clinic this summer. Custer is in her third year of facilitating the Lincoln City tide pool clinics, which run from late April to mid-July. “The beach at Lincoln City is a microcosm of all the Oregon Coast has to offer,” she says — people who have never even seen the ocean before, some of whom don’t realize that sea stars are living creatures. “It’s incredible to watch them discover these things,” she says. After beginning each clinic with a quick safety overview — always keep one eye on the ocean — Custer leads her tours out to her favorite rocky outcropping in front of Northwest 15th Street. This diverse tide pool is one of the easiest to access, but the pools in front of Inn at Spanish Head Resort and at Roads End State Recreation Site are also excellent. Custer’s guided clinics meet at the beach entrance and last about an hour — just look for Custer in her bright-orange rain pants and you’ve found the right spot. If you’re exploring solo or with your family, the best time to go is during low tide, when the rocks and pools are most exposed. The crowds can get quite busy in the spring and summer. Custer urges visitors to be careful on the rocks as they’re craggy, slippery and very much alive. “If it’s green, purple, orange, or just looks organic, tiptoe around it,” she says. Whenever you’re out exploring, be sure to follow Leave No Trace principles: Take nothing but photos, leave nothing but footprints. 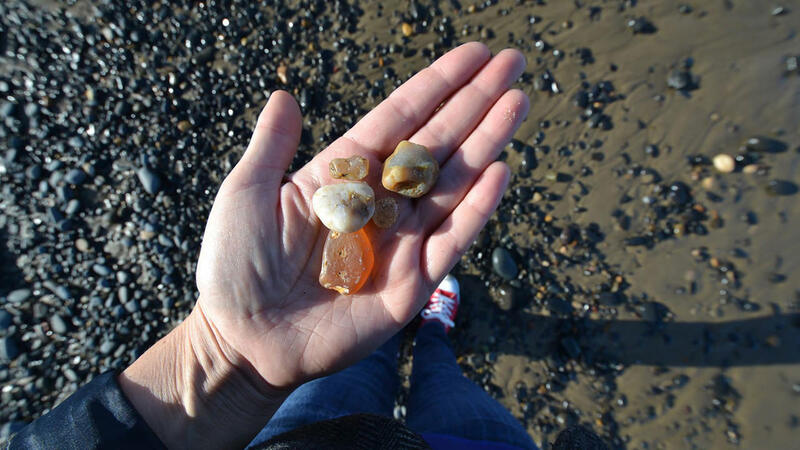 Follow a beachcombing guide or go on your own to find agates, driftwood, sand dollars and glass floats all year round. A stone’s throw down the shore from Custer’s tide pool clinics, beach-goers can join a beachcombing clinic (January to late April) and hunt for precious beach treasures with the help of a guide. Because the beach in Lincoln City is so long, the combing is almost limitless. The shore changes from day to day and season to season. The best time to set out is generally two hours before low tide, when there’s the most exposed beach. Find a stick and poke around the high tideline for multi-colored jasper, large agates, petrified wood (it looks like a dull rock with wood-grain patterns), and you might even find a fossil. Place your treasures into your bucket for the beach house mantel or let your kids make some art. Just be sure to keep your eyes on your kids, pets, and most importantly, the ocean, at all times. Beachcombing clinics meet at the Southwest 33rd Street beach-access point, where a facilitator will take you on an easy beach stroll and help you identify things along the way. While combing the beach you might even find a hand-blown glass float made by a local artist. Now in its 20th year, Lincoln City’s Finders Keepers program hides more than 3,000 colorful hand-blown floats throughout the year along its public beaches for people to find and take home, and runs year-round. Best spots to catch a DIY fresh seafood dinner? Find out at a clamming or crabbing clinic this summer. 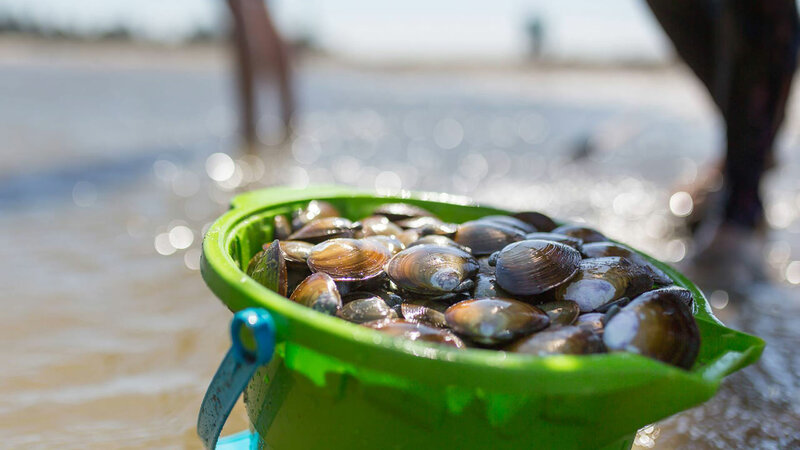 If a bowl of homemade Oregon clam chowder sounds good, Lincoln City’s clamming clinics (May through September) will help you dig up these tasty creatures and take home a feast. Anyone can dig in Siletz Bay at low tide. Just bring your shellfish license, a bucket, shovel and gloves. Look for “shows” — clusters of holes in the sand near the tideline — and then shovel a hole about 14 inches below the surface and dig out dinner with your hands. It’s that easy. The daily limit for purple varnish clams, the most prominent in Siletz Bay, is 72. You can get this in an hour on a good day. Clamming clinics meet just south of Lincoln City’s Historic Taft District. Dress warm and prepare for the whole family to get sandy and have some fun. 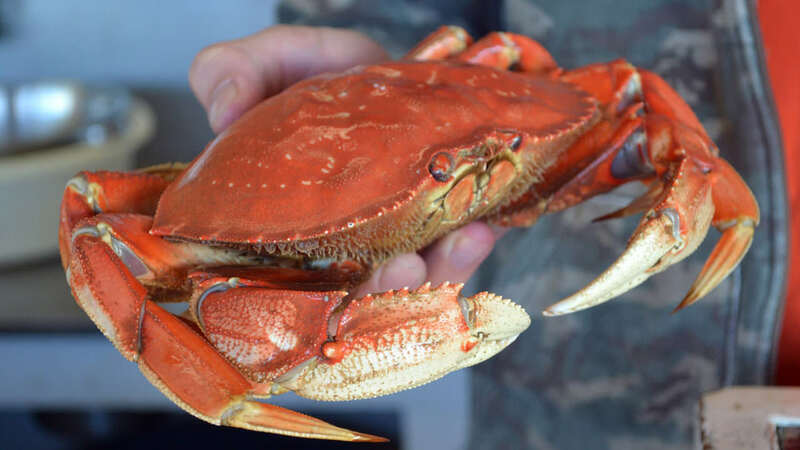 Siletz Bay is one of the state's top spots for Dungeness crab. Grab your permit, bait your trap and set the table for a feast. Nothing beats fresh Dungeness crab pulled from Lincoln City’s Siletz Bay. The city holds crabbing clinics (May through September) for all levels of crabbers, but it’s also easy to crab alone. The best time to go is several hours after low tide, when the crabs are active and the current disturbs your traps the least. Just bring your shellfish license, up to three traps, a measuring gage, raw chicken legs for bait, and gloves. After baiting your trap, you can stand right there on the shore and throw your trap’s line straight into the bay. The hardest part is the waiting. Give it at least 10 to 15 minutes before you pull in your trap, and put only male crabs 5 ¾ inches across or wider into your cooler. The Oregon Coast can be wet and chilly, even in summer. Make sure you pack waterproof or river shoes, a rain jacket, sunscreen and a hat and gloves. Always pack a sweatshirt. After your shore adventures, indulge in Lincoln City’s diverse culinary scene. From the shrimp curry at Thai Bay to Mo’s Seafood & Chowder and fancy neo-Northwestern fare at The Bay House, there’s something for every taste. 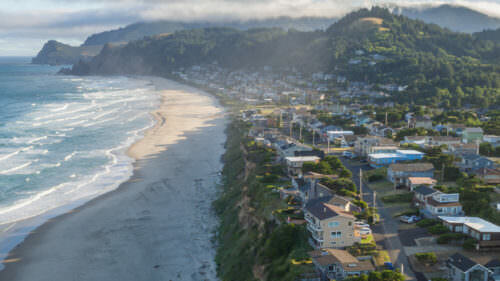 Check out other activities in Lincoln City and find the perfect place to stay, whether you’re looking for a romantic inn, an oceanfront resort or a hotel where the kids can play dolphin in a heated pool.